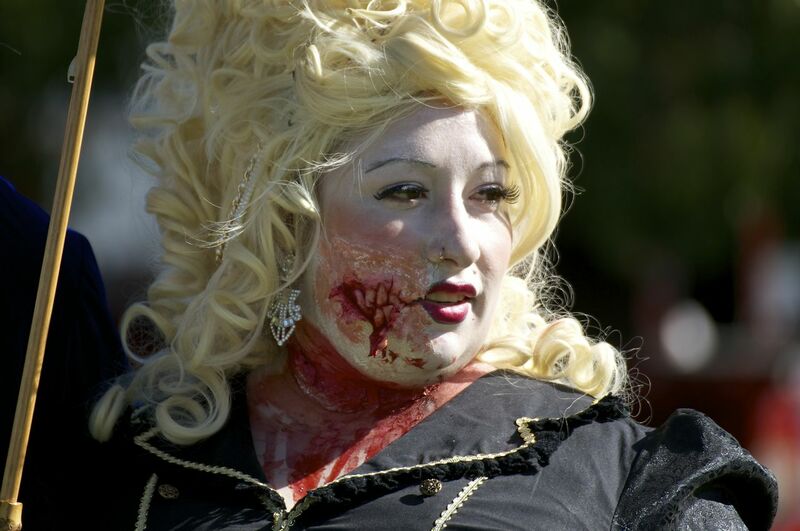 Adelaide Zombie Walk | Hello World! Have you ever seen a zombie walk? Basically it is a social gathering of people dressed as zombies walking around the city! 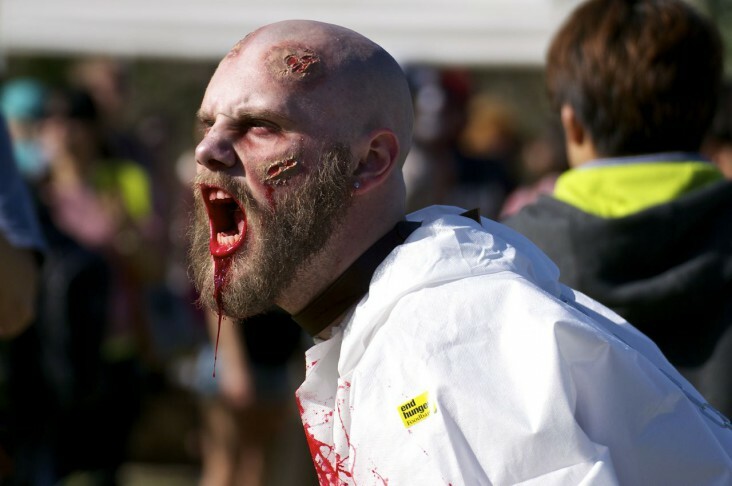 It is becoming more and more popular and a lot of cities such as London, Montreal etc… are hosting a walking dead procession around Halloween time! I have seen a zombie march when I was living in Montreal and I must say despite the cold it was really entertaining some people were really into their “characters”. 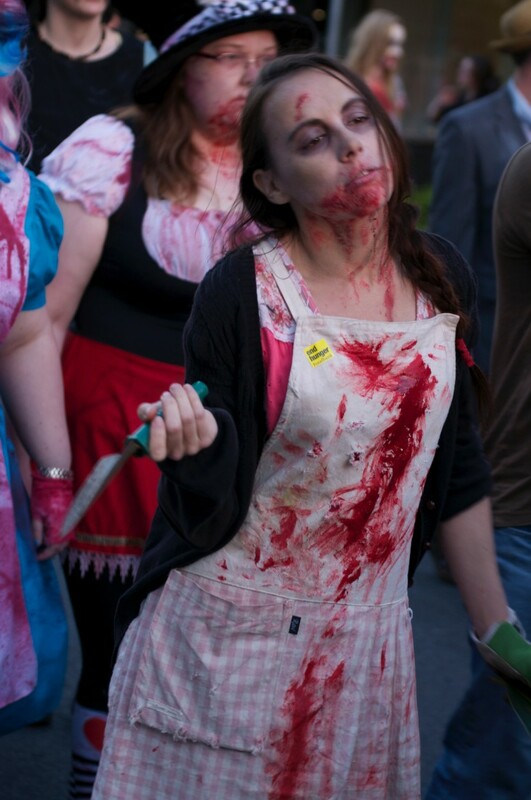 I moved to Australia early September 2014 and when I heard there would be a zombie walk in Adelaide CBD in October, I decided to make it count! This time I would not just watch, I would be one of them: walking crooked, looking disconnected, groaning… But first, I had to find a costume, a character that would express my story… how did I become a zombie, what was I doing last before being bitten? Since I had just moved to Adelaide I did not have much (no accessories or clothes to trash) so I decided to go to a charity shop or like they say here an “Op shop” (opportunity shop)! For less that $10 I found a girly pink top and a dress that made me think of a gardener apron… I decided that it would be perfect since there were some gardening tools in my fully furnished house that I could use to complete my costume! Now I had my story: I was a garden lady taking care of my roses when I got suddenly attacked and bitten by a crazy zombie! Then the trick is about make up, then laminating my costume (using a cheese grinder!) and make it look dirty like I spent weeks wandering in the streets of Adelaide (I scrubbed it on the pavement and in the grass outside)… the result was absolutely perfect! 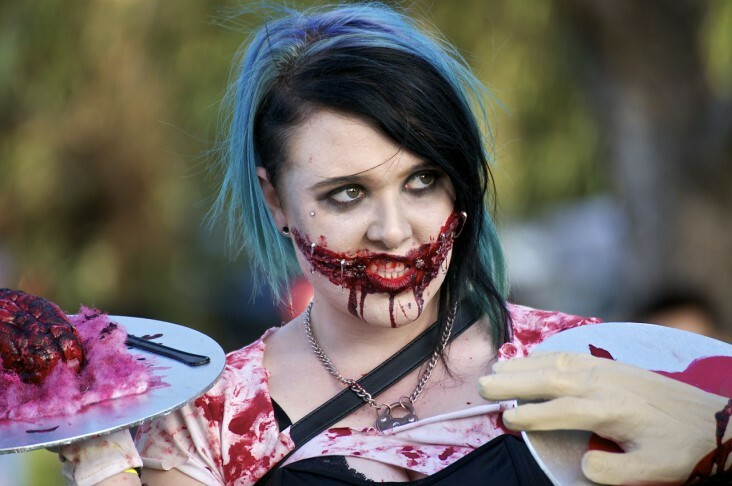 I think it is so cool that Adelaide can compete with other major cities by hosting a really amazing and entertaining zombie walk with thousands of walking dead marching on our streets! When you think it all started a couple of years ago with a few people who were passionate about it and decided they will make it happen no matter what… at the beginning it was a really discrete and small event but as the years go by it is getting more and more famous and important and I think it is wonderful to be part of it! Did you ask for a pizza with anchoves? Previous PostRedNext PostYou should drink more water!